The only thing brighter than Joshua Brathwaite’s 100-watt smile was the gleam on his freshly shaven head. 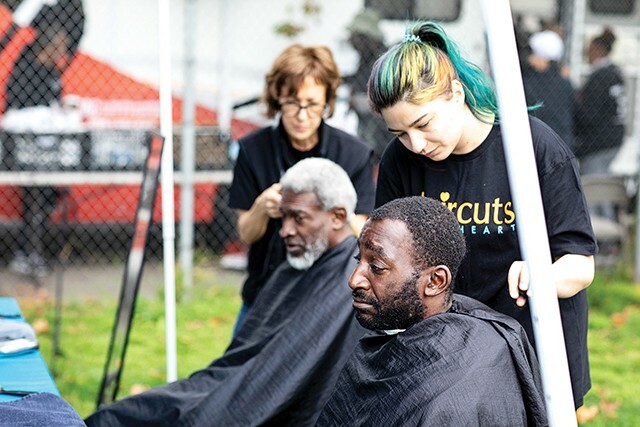 Braithwaite was the first client of the day at Haircuts with Heart, a booth at a West Oakland community fair in October that offered free haircuts to the homeless. Staffed by volunteer Oakland stylists, Haircuts with Heart also provided manicures, makeup, and gift bags of shampoos, soap, and toothbrushes. But the most important thing clients got was that intangible thing that the best haircutters dispense every day: good conversation, a little personal attention, and an overall feeling of looking sharp. 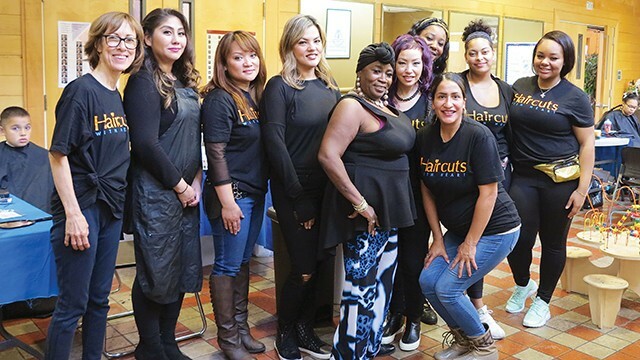 Since it started two years ago, Haircuts with Heart has provided more than 1,000 free haircuts to Oakland’s homeless, veterans, and women and children who’ve been trafficked or are escaping domestic abuse. Several times a month, shears and blow-dryers in hand, stylists descend on shelters and community fairs to comb out the tangles, trim the split ends, and make people beautiful. October’s event was part of a homeless service fair sponsored by Lava Mae, a San Francisco nonprofit that provides hygiene and other services to the homeless. After years in San Francisco, Lava Mae has now expanded to Oakland, making weekly visits to homeless camps with a transit bus that’s been outfitted with showers and toilets. Showers are important, but nothing cheers like a good haircut, said Deborah Schneider of Lava Mae. Haircuts with Heart started with Rebecca Beardsley, owner of Shine Forth salon on Piedmont Avenue. Like many Oaklanders, she was growing increasingly troubled by the plight of burgeoning homeless population and wanted to help. She’d been a stylist for more than 30 years, working everything from New York Fashion Week to magazine shoots. Haircuts with Heart started two years ago and has provided more than 1,000 free haircuts to Oakland's homeless, veterans, women, and children. Haircuts, she said, seemed like an obvious way she could help. So she contacted every stylist and salon she knew and started organizing visits to shelters and community fairs. In her outreach efforts, she met Teresa Delgado, owner of Touch salon in Montclair, who coincidentally was also giving free haircuts to the homeless, and the pair joined forces. Delgado said she was inspired to help after seeing a woman root through trash near an overpass in search of clean paper. Delgado watched her for awhile, eventually realizing the woman was looking for clean paper to tend to personal hygiene. For Ickes-Saman, it was easy to say yes when Beardsley called. Ickes-Saman had been homeless herself when she was a teenager and knows what it’s like to be hungry, cold, and scared on the streets. “Hair is the last thing you worry about,” she said. With that in mind, she tends to give her women clients short, stylish haircuts that require little maintenance but are still flattering. But not always. Sometimes, she said, women want a little extra primping. After so much time struggling with survival, some women want a touch of glamor — at least for a while, she said. Haircuts with Heart now works with 17 shelters and agencies that serve the homeless and has more than 65 volunteers. The group is saving money for a van so stylists can offer shampoo service as well. The clients are as varied as the homeless population as a whole. Some live on the streets, but many live in their cars or couch-surf, the so-called “invisible homeless.” Some even have full-time jobs, but the high cost of housing in Oakland has left them without a permanent address. Brathwaite falls into that category. He said he’s a full-time employee at the Tesla plant in Fremont, working the graveyard shift on the assembly line, but can’t save enough for a deposit on an apartment. So until things change, he’s living in his Suburban in West Oakland. He usually cuts his own hair, but there’s nothing like a professional cut, he said. For more information about Haircuts with Heart, go to HaircutswithHeart.org.